As Aaron defines it, it is his 2nd attempt to describe complex organizations through simple frameworks in the most comprehensive way possible (the first being the responsive.org manifesto). From a content perspective, while drawing from the works of dozens of people, the strong influences of Frederic Laloux’s list of structures, practices, and processes in Reinventing Organizations is clearly noticeable. No-judgement- leaving each of the boxes (components) blank, leaves room to study any potential permutation, without judgement, seeing how small changes may affect the interactions between the different pieces and the whole. While this framework is a huge step forward, its structure also clarifies the value that it is yet to unlock. The simple 3x3 layout implicitly suggests that “all parts of the organizational OS were created equal”. I strongly believe that this is not the case, and there’s some directional/sequential relationship between the different component. For example, the organization’s purpose and its beliefs about human motivations seem to be deriving / constraining some of the other components, while the inverse seems to make less sense. 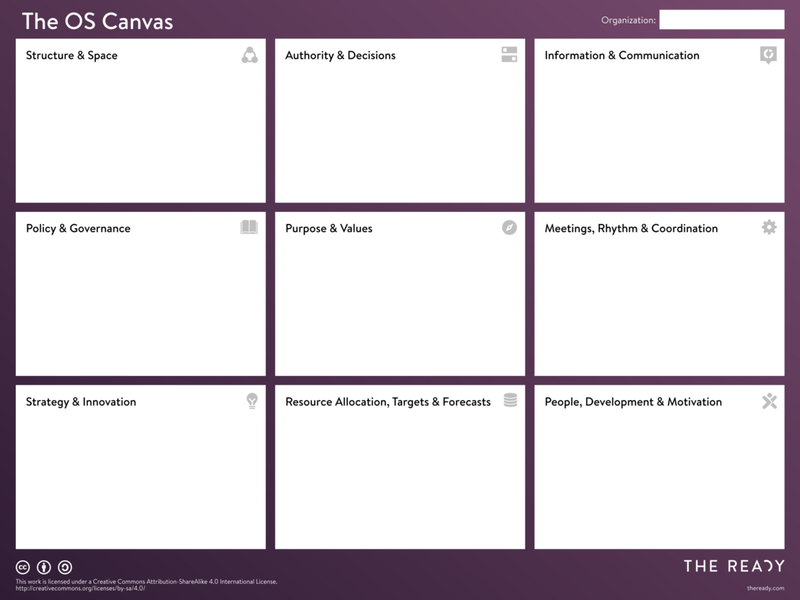 The canvas idea gives us the opportunity to capture not only what the different parts are, but also, to some extent, the way they interact, which a critical attribute of the organizational system. Lastly, I suspect that if we follow the intent to capture interaction as part of the canvas to its conclusion, we’ll discover that some of the initial “pairings” (all boxes are currently in “X & Y” or “X, Y & Z” format) don’t make sense anymore, and need to be reshuffled in order to make the interactions more apparent. Looking forward to v3.0 from Aaron and team, so I can compare it to my own.